Sign of Life: Set in a typical suburban strip mall, Fusion restaurant fires up an atypically diverse cuisine. EXOTIC transformations in cooking take place in chef Yung Le's kitchen. The instant we crossed the threshold of her restaurant, aptly named Fusion, we embarked on an expedition into the heart of a rare and delicious melding of diverse ethnic flavors. This skillful, inspired chef has conceived an exquisitely delicate style, one that both clarifies what good fusion cooking is and reinvents this emerging (and often poorly executed) genre of cooking. 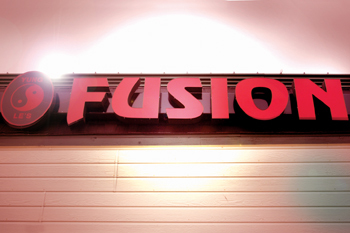 Fusion resides in a storefront inside a typical suburban strip mall. Once the doors of the restaurant closed and we glimpsed the windows pulsating in soft shades of blue, we felt sequestered in a lovely, cheerful place with reminders of the mall slipping away. We found ourselves in a dining room of enchanting Asian design, where warm, understated elegance blended with muted colors. All is richly enhanced by a collection of intriguing wall hangings and ceramics set against dark-stained wood paneling. Yung Le's adept manipulations of herbs and spices, peppery hot and minty cool, sweet and sour in sauces reduced glossy and liquid, embody what fusion cooking is really all about--that elusive harmony where opposites become one, and the influences of China, India, Thailand and Vietnam hold hands and sing. New flavors are created in this alchemy that lift the taste buds to higher levels of pleasure. The dishes vibrate with bright colors and wonderful fragrances of lime and tamarind, ginger, coconut and peppers that prickle in the air. Not one dish came off as forced or uneven. We tasted many dishes that night, opening with a sampler ($10) of chicken satay, potstickers, crispy rolls, samosas and our favorite, the Fusion Salad ($4.50 by itself). Slivers of shredded cabbage, jicama, carrots, grapefruit and peanuts were exquisitely assembled in a herb-laced vinaigrette. Since I had been discoursing on the health benefits of green papaya, my guests insisted we give Fusion's version a try. The shreds of the medicinal fruit, combined with tomatoes, herbs and spicy lime fish sauce, opened the sinuses and rekindled a desire for long walks on cold nights. From seasonal specials, we ordered the Happy Pancake ($12), thin and crispy and folded over a sauté of shrimp, chicken, mung beans, mushrooms, bean sprouts and caramelized onions. We broke off pieces, wrapping them in lettuce, drizzled with tangy dipping sauce. Also from the seasonal menu, we chose an ocean-sweet whole crab (price varies), split into meat-laden quarters and sautéed in a rich oyster sauce fuming with ginger, garlic and black pepper. It was so good that we sucked the shells and licked our fingers. Our fingers proved more efficient than forks when handling our order of East Indian­style lamb chops ($17), marinated in yogurt, cumin, coriander and lemon juice and cut thin for optimum flavor. With the meat came cumin rice and broccoli almondine. To complement our lamb, we selected the specialty Mi Quang ($9), composed of rice noodles wok-fried with garlic, chives, bean sprouts and aromatic morsels of five-spice pork tenderloin. In the grand finale, a trio of Fusion's best desserts (all $5) came to us freshly prepared and presented without clutter or confusion. We spooned our way through custardlike mung bean pudding ($5) with mango, banana and sugar cane sauce, a velvety ginger crème brûlée ($5) and sweet juicy mango and sticky rice ($5). These desserts should not be skipped. A sweet-natured staff attended patrons as if they were royal guests. Our waitress was exceptionally kind and knowledgeable about the foods Yung Le prepared. Even the chef occasionally steps away from her kitchen to stroll through her dining room, discussing openly all her philosophies and methods of cooking. Yung Le has accomplished so much with so little. Her masterful cooking style coupled with fresh meats and produce offers a culturally diverse cuisine that celebrates the bounty of our collective soul.